It truly was a star-studded event at The Star in Frisco on Monday morning, when 16 members of the Dallas Cowboys’ Ring of Honor gathered for the unveiling of the Ring of Honor Walk. The Dallas Cowboys Ring of Honor is dedicated to former players and coaches who have made outstanding contributions throughout the team’s history. The Ring of Honor Walk presented by Dr Pepper is located along The Star Boulevard and Cowboys Way, leading up to Tostitos Championship Plaza and Ford Center. Along the Walk, each Cowboys legend is individually recognized with a list of their accomplishments and a monument established in their honor. Former Cowboy greats Troy Aikman, Tony Dorsett, Charles Haley, Cliff Harris, Chuck Howley, Michael Irvin, Lee Roy Jordan, Bob Lilly, Drew Pearson, Don Perkins, Mel Renfro, Emmitt Smith, Roger Staubach, Randy White, Darren Woodson and Rayfield Wright were present. Also in attendance were family members of deceased Ring of Honor members Bob Hayes, Don Meredith and Tex Schramm, and Tom Landry, bringing the total to 20 of the 21 Ring of Honor members represented. Only former Dallas offensive lineman Larry Allen, who was unable to attend, was not represented. Cowboys longtime radio voice Brad Sham emceed the short presentation inside a plaza at The Star near Cane Rosso, one of the newest restaurants to open at the complex. Frisco Mayor Jeff Cheney was the first to address what was an overflow crowd of media, Cowboys officials, and other interested parties. Following the Mayor’s short remarks, Cowboys owner and general manager Jerry Jones addressed the crowd. Then, artwork featuring each member of the Ring of Honor was unveiled on both sides of the plaza. On the east side, paintings featuring Wright, Harris, Hayes, White, Renfro, Howley, Meredith, Lilly, Perkins, Staubach, Jordan, Landry, Dorsett, Schramm and Pearson appear. Images of Allen, Smith, Aikman, Irvin, Haley and Woodson grace the west side of the plaza. 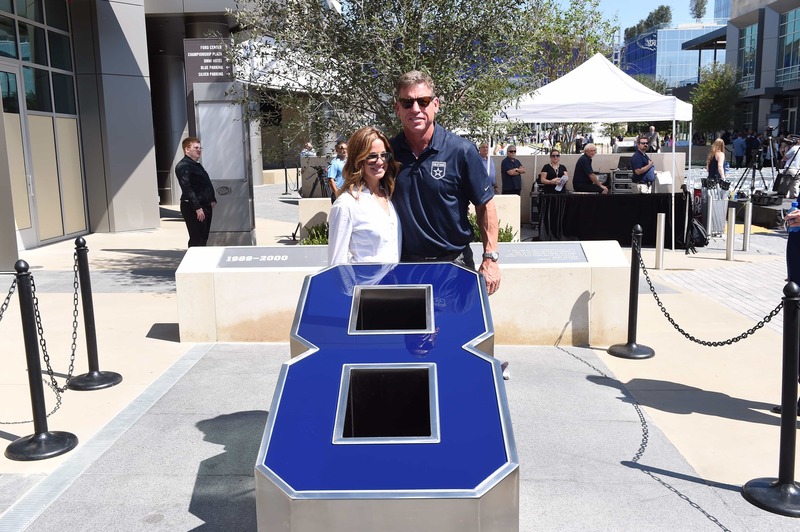 “It’s great,” Troy Aikman said of the unveiling. “I remember when I came to Dallas the first time in 1989 and played in the Cotton Bowl. We practiced at Texas Stadium and I’ll never forget it. I walked out there, on the stadium field for the first time. Each inductee or their representatives then made their way to their individual monuments up and down the sidewalk near the plaza to unveil their monuments one at a time. Every Ring of Honor member has their own monument bearing their numbers and facts about their celebrated careers, a nice way to honor these football immortals who each did their share to help put the Cowboys on the map, not just in the American sports scene, but also around the world. And as each Ring of Honor member present at the event addressed the media following the ceremony in the atrium of Cowboys World Headquarters across the street, Irvin couldn’t help but convey his gratitude toward Jerry Jones. I thank God for having Jerry as our owner and the way he does things and brings things back together. He believes and holds high the history and tradition of the Dallas Cowboys, and he doesn’t do anything without involving that history and that tradition,” Irvin said. And Irvin, who was inducted into the Ring of Honor alongside Aikman and Smith in September 2005 in a ceremony at the Cowboy’s former home, Texas Stadium, remains grateful to be honored by the team he spent his entire NFL career playing for. The timing for the unveiling of the Ring of Honor Walk couldn’t have been better on the Cowboys’ part since Monday afternoon was the first of several practices during training camp open to the public at Ford Center. Tickets were free for these open practices, but as expected, Cowboy fans quickly snatched them up. The Star in Frisco is now welcoming the public for viewing of the Ring of Honor Walk as well as the restaurant and retail spaces located within the grounds of The Star.